It was worth it just to see my daughter’s eyes light up when she walked into our family room and saw it transformed into a fantastical tea party. The forecast called for a constant drizzle and I was worried the weather would dampen our party plans. 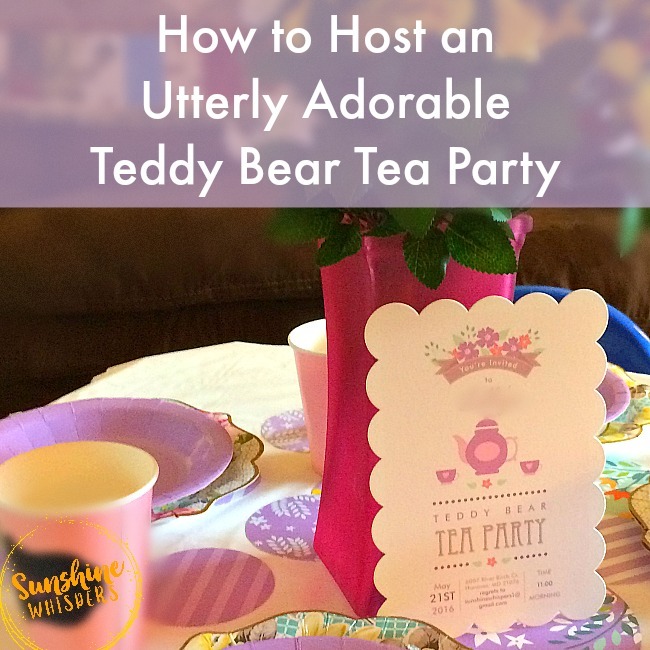 As it turns out, you can host an utterly adorable teddy bear tea party inside on a rainy day too! One by one, Sweet Pea’s friends arrived with their furry companions and before long, everyone was seated around the party tables, munching on edible ladybugs, butterflies, teddy bears, and other dainty treats. 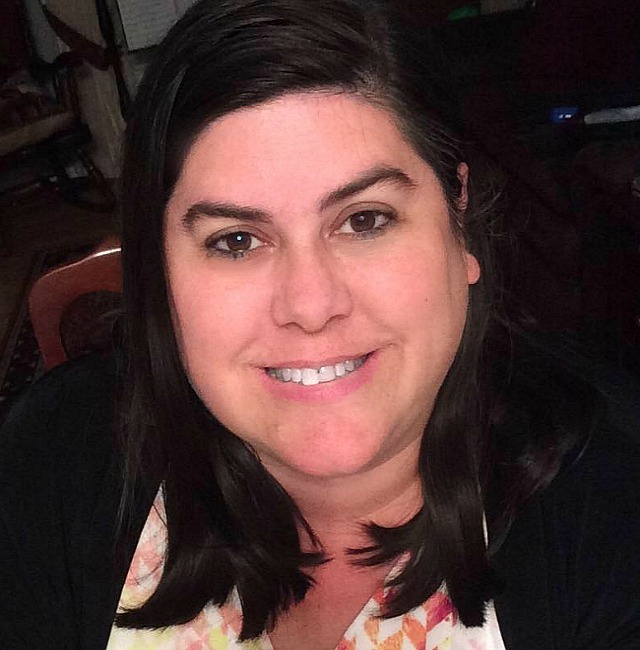 I was compensated for most of the paper products from Minted.com but my review of their party supplies is 100% my own opinion. 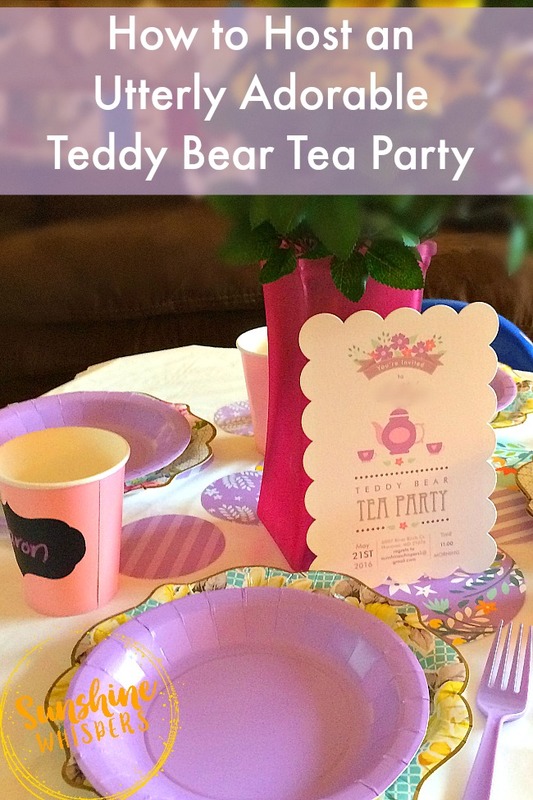 Also, not all the party products used for the Teddy Bear Tea Party are from Minted.com. 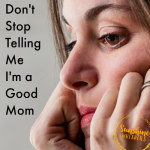 Affiliate links to those products are included for your convenience. I know this looks like it took forever to put together, but really it took less than 3 hours to make all of this food. The trick? Keep the party at a manageable size. I sent out 15 gorgeous invites (see the photo above) and expected about half to RSVP yes. We ended up with 10 hungry kiddos on the day of the party. It was crowded on a rainy day but totally fun. When I prepared these treats, I made 10 each, exactly. That kept the preparation manageable. 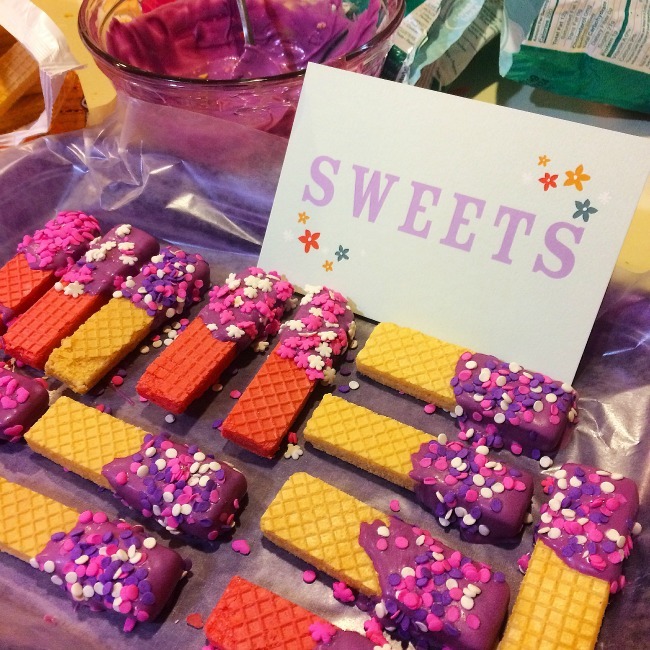 Chocolate-Dipped Princess Wafer Cookies: This was the only party food I made the night before. Just purchase melt-able candy circles from a craft store or online. Follow the melting instructions to melt the chocolate. Dip the wafer cookie in the chocolate and sprinkle with festive sprinkles while the chocolate is still soft. Place the cookies on wax paper, cover, and set in the refrigerator to cool until you are ready to serve. 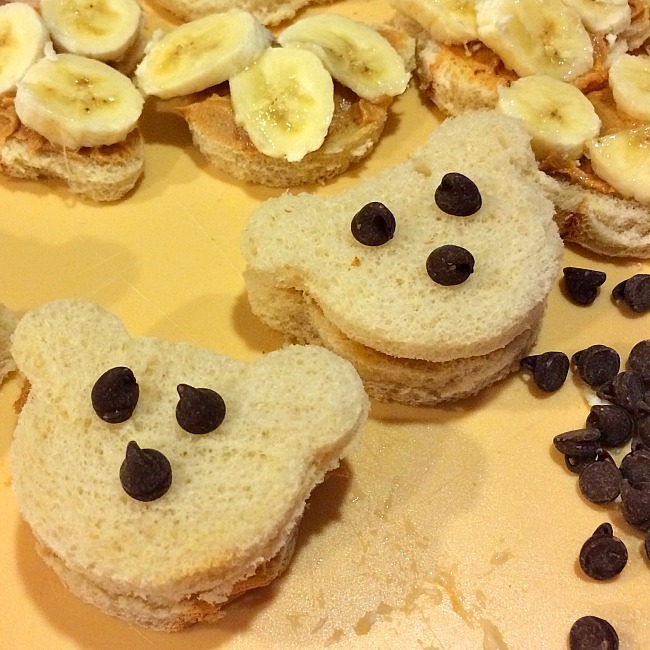 Teddy Bear Banana and Honey Peanut Butter Sandwiches: You will need a decent sized Teddy Bear cookie cutter. Cut out two teddy bear heads from one slice of bread. 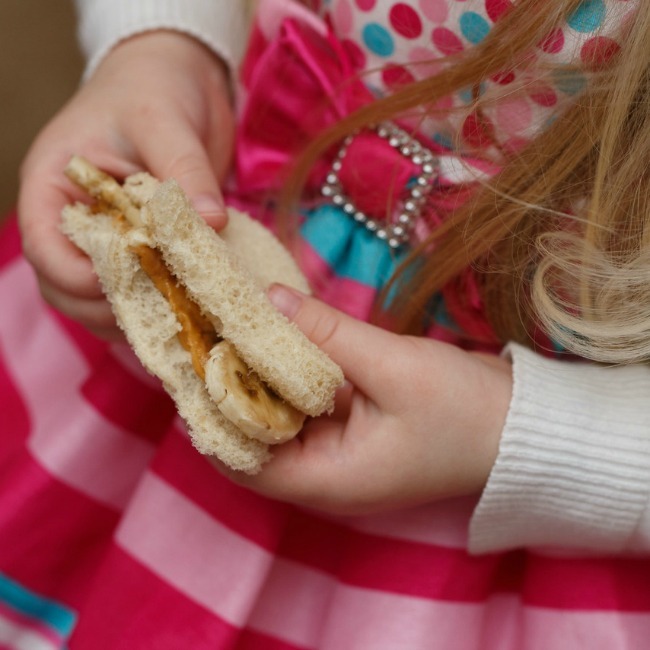 Slice a banana (you may only need 1 or 2 bananas for 10 Teddy Bear sandwiches), and mix peanut butter and honey together until the mixture is smooth. Spread peanut butter on one bear head, add the bananas, and cover with the second bear head. Place three chocolate chips on the bear face for the eyes and nose. Butterflies on a Log: This treat couldn’t be easier to make. Cut a 3-4″ piece of celery per butterfly. 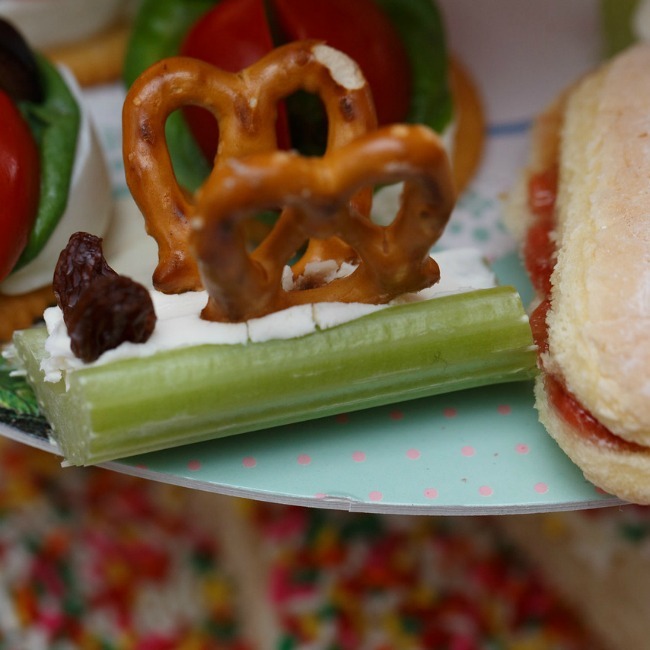 Spread the center with cream cheese, stick two mini pretzels in the middle of the celery angled out to form wings. Stick two raisins in the front of the cream cheese for the butterfly eyes. How easy is that? Jam-Filled Ladyfingers: Again, this couldn’t be easier– buy ladyfingers. Cut them in half lengthwise. Spread a thin coating of strawberry jam onto each one to make a sandwhich. Done. 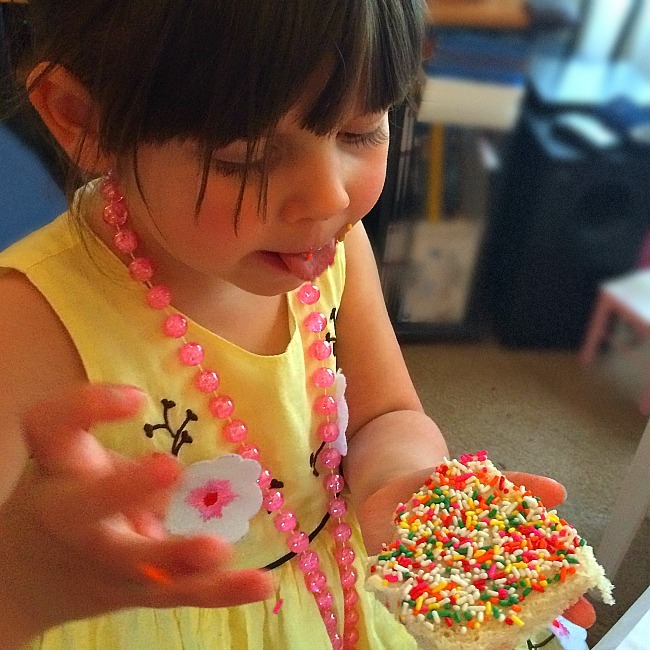 Fairy Bread: I borrowed this whimsical idea from Australia where it is apparently very popular. 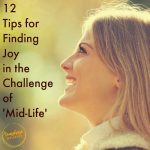 It also happens to be ridiculously easy to make. Cut the crusts off of about 10 slices of bread (so, one per kid). Slather each slice with butter (you will want the butter to be at room temperature). 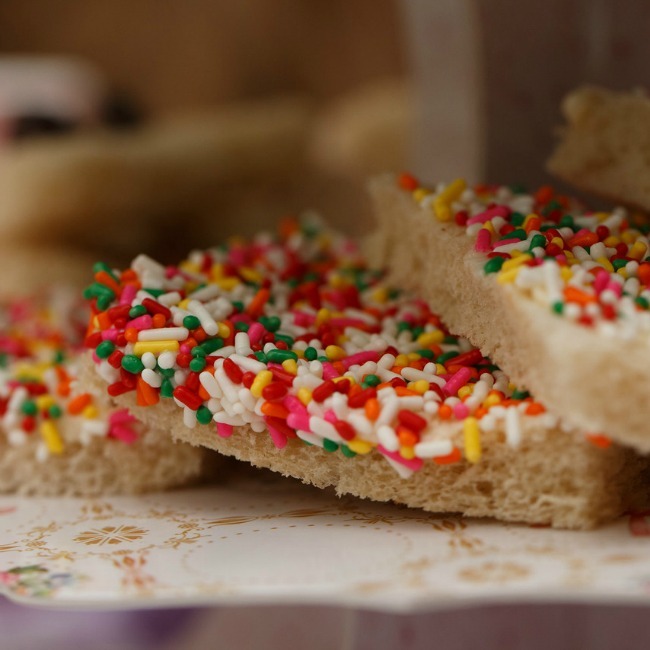 Then, basically pour an entire container of sprinkles onto the buttered bread for a colorful treat. I suppose if you really wanted to wow your crowd, you could substitute butter for marshmallow fluff. Now, that would be a super sweet treat! Kiwi and Raspberry Flowers: Simple and bite-sized (ie: I couldn’t find a small flower cookie cutter to use). Slice kiwi or use a cookie cutter to cut out kiwi circle shapes. Stick a raspberry upside down on the kiwi for the middle of the flower. Done. 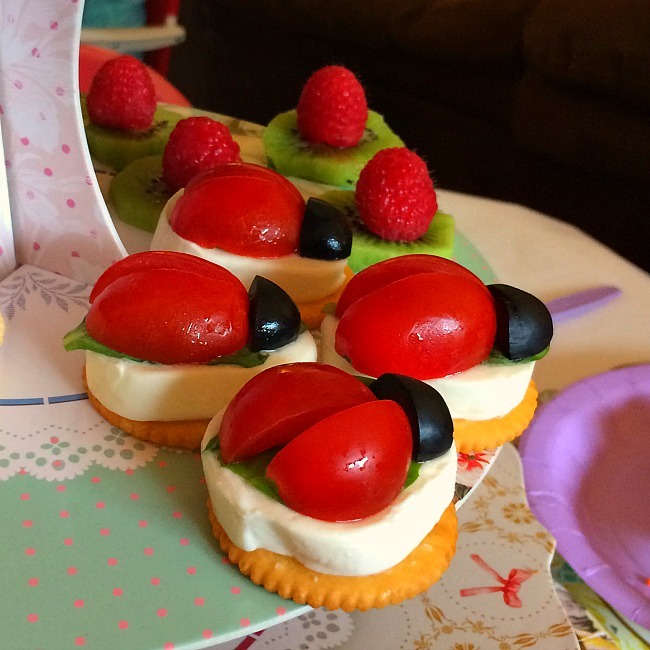 Ladybug Caprese Salad Bites: These are pretty fanciful too, but very easy to make. Slice a log/piece of fresh mozzarella cheese so you have small circles (I cheated and purchased pre-cut mozzarella slices). Place one slice on a Ritz cracker. Cut a cherry or grape tomato in half lengthwise. Halve it again and arrange the two halves on top of the mozzarella so that it looks like ladybug wings. Cut a black olive in half width-wise. Then cut the half in half to form the ladybug head. Place the ladybug head on top of the lady bug body. Eat. Fruit Kebab Skewers: There is nothing really to this. Pick some fruit. If you really want this to be easy, buy pre-cut melon, or even strawberries. Feed fruit onto skewers, about 5-7 pieces of fruit per skewer. Princess Tea (ie: Juice): Ok, there are a bajillion punch recipes you can try. Ultimately I decided to keep it simple and just purchased three different flavors of juice. The kids loved it! 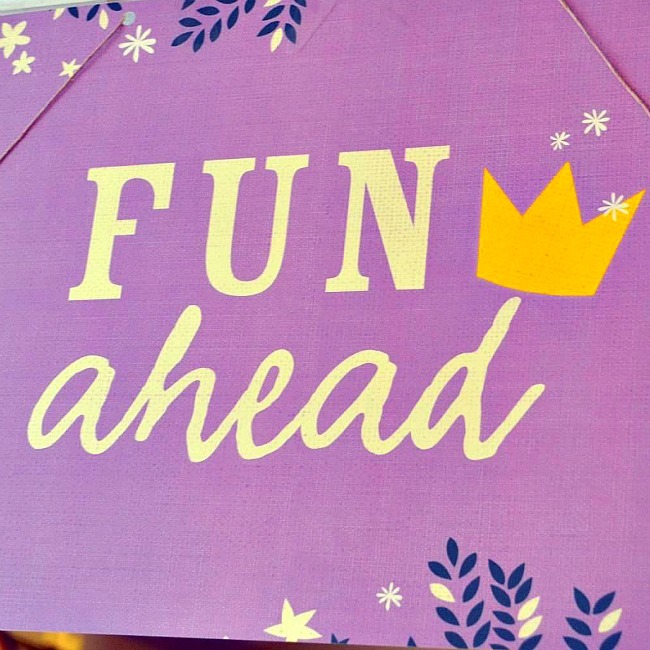 Princess Crown Personalizable Party Greeting Sign— I strung this party sign and the personalized garland from Minted.com to form a super sweet welcome to the party guests. 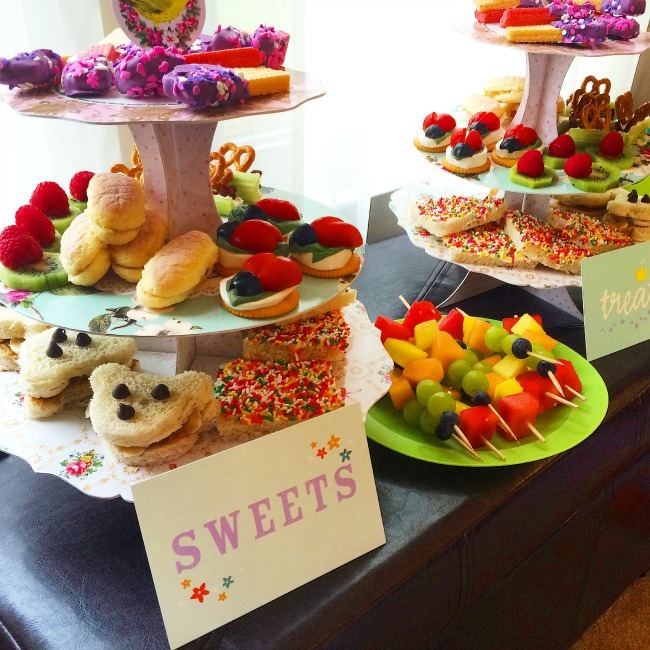 Princess Crown Personalizable Table Signs— ‘Treats’ and ‘Sweets’ These signs added a nice whimsical touch to the table-scape and really made the party room feel more festive. 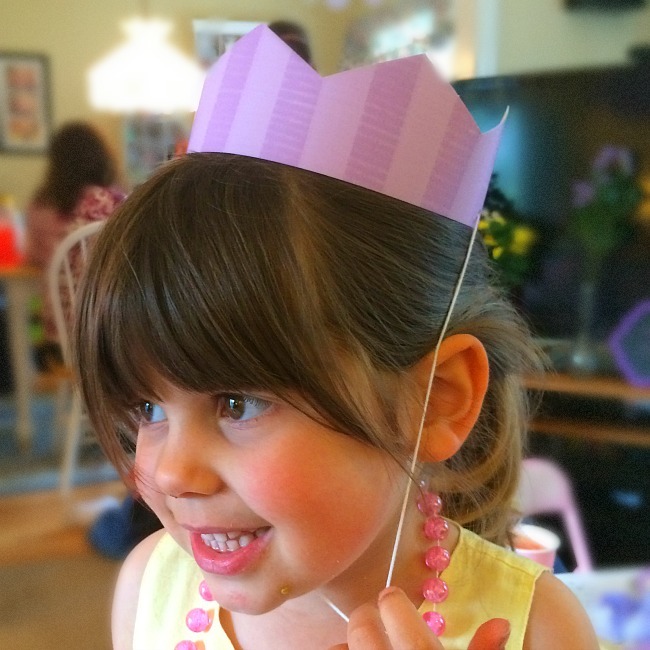 Princess Crown Table Confetti– speaking of festive. These beautiful circles matched the garland (you can see an example of this in the first photo for this post). 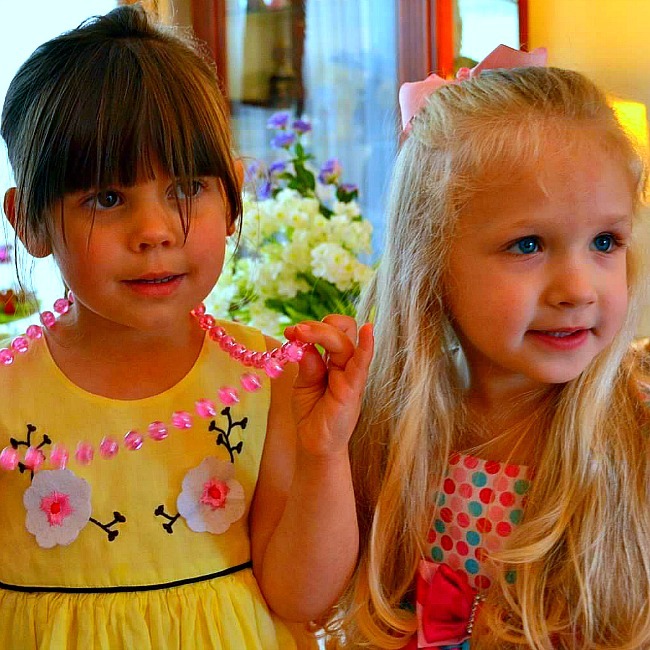 Princess Crown Party Crowns— The kids loved donning their tea party crowns. Talking Tables Frills and Frosting Tea Party Card Cake Stands — very easy to assemble and surprisingly sturdy. We kept them post-party so Sweet Pea could continue the fun on her own. Talking Tables Truly Scrumptious Pretty Tea Party Paper Plates — These plates are gorgeous. We supplemented with regular paper plates from the dollar store (purple of course though). Chalkboard Label Stickers — I added one sticker to each cup and then used a chalk marker (included with the stickers) to write each guest’s name. This also served as a place card. 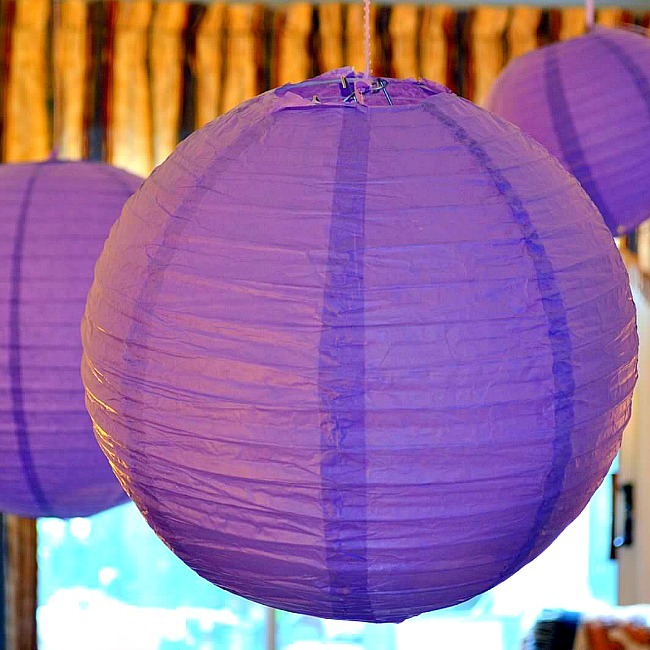 Purple Hanging Lanterns– Since the party was indoors, these paper lanterns really transformed our family room into a whimsical tea party setting. Fresh or Fake Flowers (you can usually get really great deals at craft stores)– Fake craft flowers are great. You don’t even need to put them in water! The kids had a blast trying the different types of foods. Everyone brought their favorite stuffed friend. 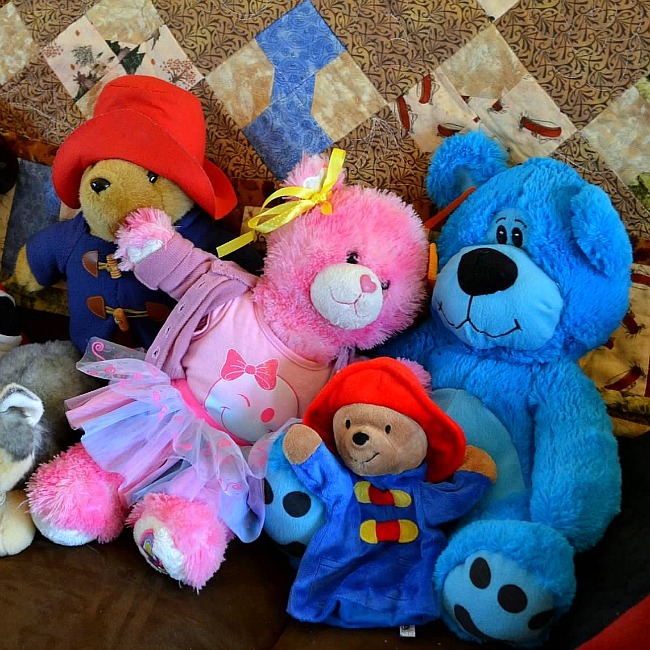 While the kids enjoyed each other’s company, the ‘bears’ bonded on the couch. They didn’t seem to mind too much. The entire set up and food preparation for the party took about 4 hours; 1 hour the night before and 3 hours the day of. Supplementing the decorations with supplies from Minted.com really made the tea party even more special. You have to be 18 to enter. This giveaway is limited to participants in the United States (sorry everyone else). Only one entry per person (you enter by providing your email address). No purchase necessary to enter the giveaway AND making a purchase does not increase your chance to win. How cool is that? 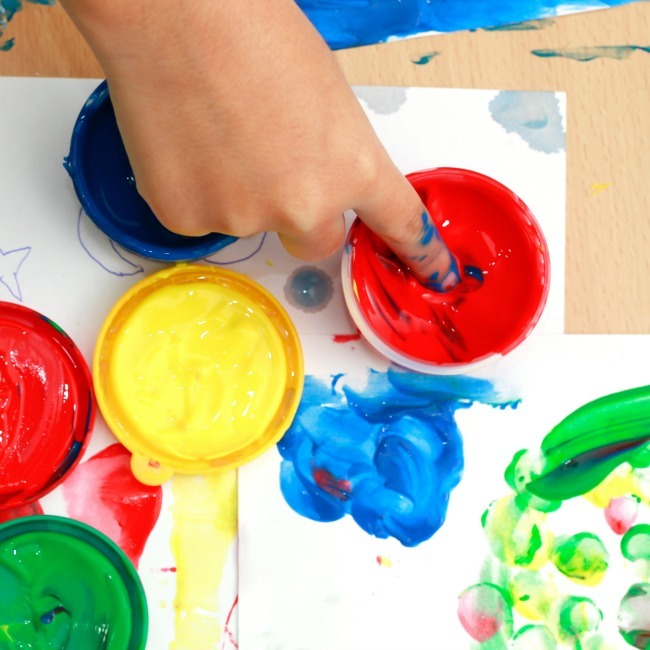 So, click here or on this picture below and enter to win $150 in Minted.com products. And whether or not you win, you should really check their website out. They have awesome party invitations, home decor, party supplies, and really neat notebooks, among other things. Previous Post: « Your Ultimate Guide to Planning an Iconic 4th of July in DC With Kids!